YPBPR is a color space used in video electronics, in particular in reference to component video cables. YPBPR is the analog version of the YCBCR color space; the two are numerically equivalent, but YPBPR is designed for use in analog systems whereas YCBCR is intended for digital video. YPBPR cables are also commonly referred to as Yipper cables. YPBPR is commonly called "component video," but this is imprecise, as there are many other types of component video, mostly RGB which syncs either on green or one or two separate signals. Some video cards come with video-in video-out (VIVO) ports for connecting to component video devices. YPBPR is converted from the RGB video signal, which is split into three components: Y, PB, and PR.
) and synchronization (sync) information. Y = 0.2126 R + 0.7152 G + 0.0722 B Before the advent of color television, the Y axis on an oscilloscope display of a video waveform represented the intensity of the scan line. With color, Y still represents intensity but it is a composite of the component colors. PB carries the difference between blue and luma (B − Y). PR carries the difference between red and luma (R − Y). Sending a green signal would be redundant, as it can be derived using the blue, red and luma information. When color signals were first added to NTSC encoded black and white video standard, the hue was represented by a phase shift of a color reference sub-carrier. P for Phase information or Phase Shift has carried through to represent color information even in the case where there is no longer a phase shift used to represent hue. Thus the Y Pb Pr nomenclature derives from engineering metrics developed for the NTSC color standard. 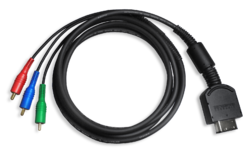 The same cables can be used for YPBPR and composite video. 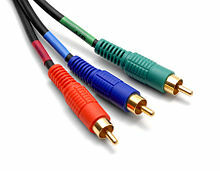 This means that the yellow RCA connector cable commonly packaged with most audio/visual equipment can be used in place of the YPBPR connectors, provided the end user is careful to keep track of the device functions (i.e. connect any one of the individual functions to the corresponding function on the other end using any cable color). A jack for the component video cable. YPBPR is a color space encoding scheme that was developed to save on cable bandwidth requirements while separating the signal enough to provide a quality image. S-Video and composite video mix the signals together by means of electronic multiplexing, however, more often than not the signal is degraded at the display end as the display is not able to separate the signals completely. It is possible for their multiplexed counterparts to interfere with each other (see dot crawl). Signals that use YPBPR, like other forms of component video, offer enough separation of the signals that no multiplexing is needed, so the quality of the extracted image is generally nearly identical to the signal before encoding. 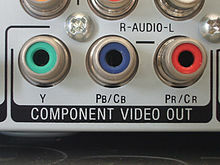 Though not necessarily an advantage to YPBPR, component video which uses YPBPR is the only one out of the three common analog cable standards (the other two being composite and S-Video) that is able to transfer non-interlaced video and at the same time able to transfer resolutions higher than 480i/p (NTSC) or 576i/p (PAL).